Yesterday I took a ride on the Coppi with my wife and a few other people, it was a nice leisure thirty miler. 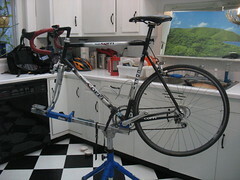 Recently I discovered a grinding noise in the—suspected—bottom bracket. So the night before, I removed the cranks and found that the Chorus sealed cartridge bearing was loose, happily finding the culprit of the noise, I reassembled and confidently took it out for Sunday’s ride with the plan of replacing the bearing during the overhaul I was intending on performing in the next few weeks. Fausto had plans of another sort for me though. On Sunday’s leisure ride, a different noise made itself apparent to me, it seemed located up near the stem or headset. During the ride, periodically I pushed down on the handlebars to recreate and emphasize the sound hoping to pinpoint it better. 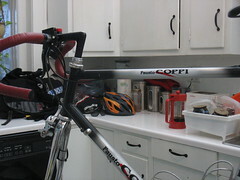 After the ride, as I was hanging it up, I decided it’s probably just the stem/bar interface and that I’d take care of it during the overhaul. It was at this point the creaking sound that had been bothering me during the ride revealed itself visually. 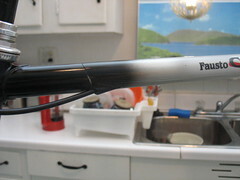 Hanging the bike up gave me a distinct view of the underside of the top tube—my stomach sank from what I saw: a hairline crack a quarter of the distance from the headset on the top tube, right at the front internal cable routing hole. Seeing this, a whole slew of thoughts flashed across my mind. First was sadness and mild anger, disappointment across the board. Next was a series of questions, how? When? Who? Me? How and when did this happen? Someone must have sabotaged it, dropped it when they shouldn’t have even been looking at it. Ugh, it was too much to bear—but I overcame all that quicker than I’d imagined; I’m still calm about it too somehow. I love that bike, how it looks, how it rides, and it’s “heritage”. A brief sense of relief was also considered; relief that I didn’t have to get hospitalized at any point on that thirty mile ride. Images of the tube separating while riding, sending me painfully off the bike somehow made me thankful I noticed it visually on my storage rack rather than “physically” wondering what happened as I lay bleeding on the pavement. Irony is telling me right now that I should have performed that overhaul I’d been planning much sooner. Especially the left side of the bike; this all makes me wonder how much the left side of a bike gets neglected. Who knows how long this crack has been progressing. There is a very small showing of rust on what I would assume the start of it would be; this is obscured however by the brake cable housing entering the port. I only wrecked once on this bike through the three years I’ve had it, and that over a year ago. A thorough inspection was performed afterwards, and nothing was found; perhaps, considering the location of the crack, the beginnings of it were overlooked, a small minuscule stress point that grew in time to the fully compromised crack that showed yesterday. 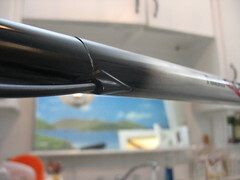 It is nearly half the circumference of the tube, the crack itself looks like it’s literally tearing, probably increased every time I “stressed” the handlebars on the ride yesterday. Wanting to rip and separate completely. This experience has made me question the integrity of steel for a minute. Especially such thin high-performance steel, like the Columbus Genius grade the Coppi was crafted from. Is it ill-advisable to ride such “vintage” steel like this? Fifteen years isn’t exactly vintage per se, but the question crosses my mind nonetheless. Historically, were internal routing ports like these prone to this type of cracking? Do they offer an easily developable point of stress? In other words, do they weaken the tube? This tubing is thin to be sure, thin and light. 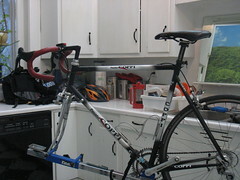 At least it didn’t suffer the same fate as my friend’s Coppi: so sad. But some explanation as to what exactly happened would be nice, only the bike knows. Had I jinxed the bike by having thoughts of upgrading/replacement, that’s definitely the only realistic explanation I can come up with. One of the benefits of steel that I always tout to people is it’s repairability. This, I’m pretty sure, can be fixed. I can get a new replacement tube brazed in. I’d opt to get a new decal set and a pro paint job reapplied. However, just writing this sounds expensive; it’s likely going to be a far far back-burner project unfortunately. So a replacement frame is in order—I’ve begun looking already. Considering the bottom bracket needs replacing, the new frame doesn’t have to be threaded Italian—that’s a silver lining I guess. Maybe I don’t exactly need a crit bike either. Research to be done, decisions to be made. oi, mamma mia! non il coppi! sure, steel can fail. but look at how it failed. i know its been said plenty, but what if that frame had been carbon? you think you could have ridden it with a crack like that? Sorry to hear about your crack, that’s a drag. I have seen it several times, Columbus and cold aren’t best friends. As far as replacement, even heat is paramount with lug work, and being that you would need to remove, dress and then braze in another top tube- that’s a lot of heat! It’ll never be the same, rideable but not ballz to the wall riding.